The Wikipedia definition of Mod states that it is a subculture that originated in London, England, in the late 1950s and peaked in the early-to-mid 1960s. There was a mod revival in the United Kingdom in the late 1970s, which was followed by a mod revival in North America in the early 1980s, particularly in Southern California. Of course, that was not the end of the story - in addition to the other movements that developed from mod (skinhead, soul boys, scooterists, rude boys, casuals etc) the mod scene itself continued uniterrupted through the 80's, 90's and into the 21st century. At some point during that time though it become something other than a youth movement. Although there were, and still are, plenty of young mods about there has been a growing appreciation within the scene that this was 'a way of life' rather than a disposable youthful preoccupation, as it had been in the 60's and at the start of the mod revival. Consequently, today you'll find mods of all generations taking part in mod events throughout the United Kingdom and Europe. And yet, still, should you want to find the youthful spirit that lead thousands of kids onto the beaches at Margate and Brighton in the 60's and filled the city centres of Belfast and Glasgow and all over the UK in the 80's, it does still exist - it is out there right now in the streets of Indonesia, as well as Singapore and Malaysia. They are the new mod breed. There has been a large scooter scene in the islands surrounding the Java Sea since the 90's and in 1996 "Scootering Magazine" proclaimed the Scooter Owners Group of Indonesia 'the biggest scooter club in the world'. But the large scooter rallys across the archipelago usually involve cut-up machines and participants who are a mixture between 'a hippie, a biker and a rastafarian'. 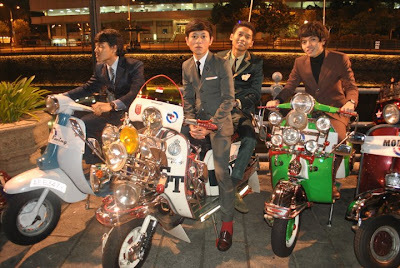 Younger Indonesians, however, reject the scruffy scooterist styles and, taking influences from everything 60's to Britpop, adopt and adapt their own mod style. At the forefront of the mod scene are the band Innocenti who's ever more soulful sound sets out to 'inspire the working classes' and 'fight against disparity'. This agenda is dynamically expressed in their newly released single HUMANIORA and the forthcoming album of the same name. Innocenti recently took part in one of many Mods Mayday events that are now a massive fixture of Indonesian and Singaporean youth culture, Mod Swing '11 in Singapore. Some of the biggest Mods Mayday events across the islands are Jakarta Mods Mayday, Bandung Belongs To Us, and Mod Swing (Singapore). Overall, many thousands of young sharply dressed guys and girls will indulge in a very British phenomenon (the underlying Britishness of the scene is quite evident from the number of Union Jacks on display and the common international language used - which is of course English). The enduring appeal of 'clean living under difficult circumstances' continues to be an inspiration for adolescents all over the world and the young mods of Indonesia, Singapore and Malaysia are just part of a worldwide movement which, having spread from it's core in the UK to Europe and the US, now has roots in cities as far apart as Mexico and Moscow. This is the new generation of mod, let's DIG THE NEW BREED! What's your opinion? You can discuss the new generation of mod in the forum HERE.